West Lafayette, IN – Another weekend, another string of outstanding performances for Austin Peay State University (APSU) track and field as they competed against both Ohio Valley opponents and a high-major at Purdue’s Fred Wilt Open, Saturday. The event offered a solid tune-up against not only the Big 10 Boilermakers and OVC foes Southeast Missouri and Tennessee Tech as indoor season enters the home stretch. The big winner on Saturday was freshman Kyra Wilder. In her first collegiate 400m attempt, the Smyrna native dusted the field for a victory, holding off Purdue’s Alanah Owens on her home turf to secure her first individual win as a Governor. Wilder also made the finals in the 60m dash, leading a trio of Govs into the last heat. She posted a 7.86 mark to place fourth overall, with freshman Tiyanna Johnson (sixth, 7.86) and junior Diamond Battle (seventh, 7.88) joining her in the finals; fourth-through-sixth were separated by five-thousandths of a second in the finals. Taking a pause from her usual spot as one of the league’s best 60m runners, junior Tymeitha Tolbert took the opportunity this week to post a fifth-place, 25.84 run in the 200m dash. The hurdles have been one of Austin Peay’s most consistently-solid events and nothing was different at Purdue. With an 8.72 in the prelims, sophomore Lennex Walker qualified second to lead five Govs into the eight-runner final; she then raced to a season-best 8.70 mark to place third overall, the best mark by a Governor in 2018-19. 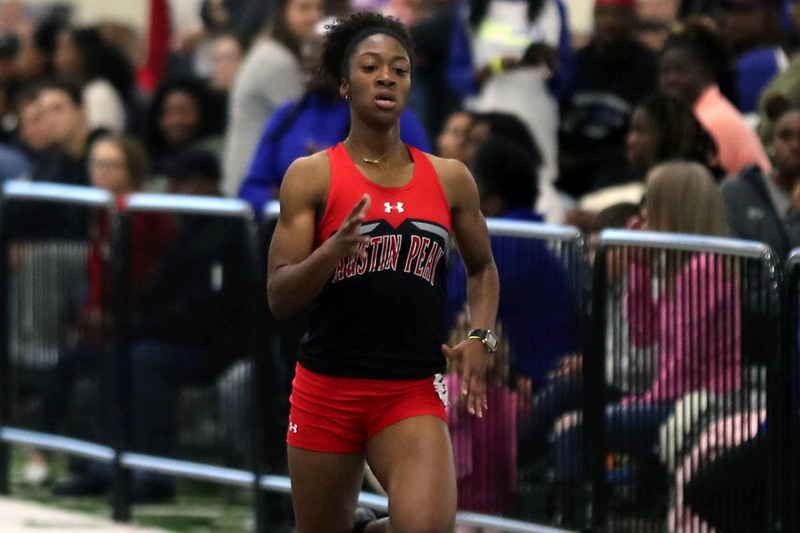 She was followed closely by freshman Camaryn McClelland (fourth, 9.00), junior Kaitlyn Black (fifth, personal-best 9.03), Kamille Dunbar (seventh, 9.13) and sophomore Denia Hill-Tate (eighth, 9.71). The Govs enjoyed success in the longer distances as well. Senior Emmaculate Kiplagat was runner-up in the mile run thanks to her personal-best 5:18.91 mark, while freshman Mikaela Smith continued an excellent freshman campaign in the 800m with a fourth-place, 2:22.02 run. In the non-NCAA 600m event, sophomore Sabrina Richman earned runner-up honors with a 1:34.14 run. In field events, senior Dascha Hix built on last week’s OVC Field Athlete of the Week-earning performance in West Virginia. She hit 3.85m in the vault, taking second overall on attempts after equaling classmate Savannah Amato’s mark in one fewer try at the bar. The Govs got a top-five performance in all three jump events. McClelland placed fifth in the long jump with a 5.37m mark, while senior Nia Gibbs-Francis (1.61m, high jump) and junior Maya Perry-Grimes (11.57m, triple jump) each placed third in their respective disciplines. Men’s cross country also got in some work this week, with Wesley Gray winning the 3000m run (8:52.71) and Nash Young (4:26.11) coming in fourth in the mile. The Govs won’t have long to wait before they return to action; next week, the Govs will be back in Alabama for their final regular-season tune-up ahead of the 2019 OVC Indoor Championships when they compete at the Samford Open, February 8th-9th, in Birmingham.